Mortise and tenon easier than half-lap? I’m planning my first table build and looking at various designs. I’ve been considering what kind of joinery to use for legs and supporting pieces and I keep coming back to half-lap and mortise and tenon joints. I know M&T is a staple of woodworking, but honestly it has scared me because it seems like you have to be able to saw and chisel with exactness and/or use tools I don’t have (e.g., drill press with large bits) or fancy jigs for the table saw and router, and there are many more steps involved. 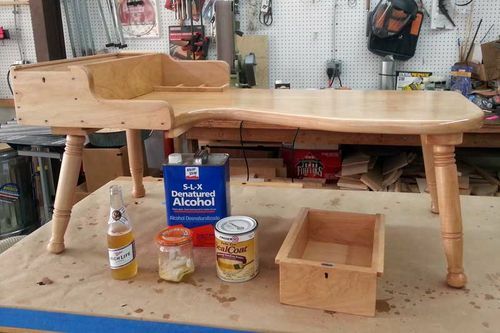 Half-lap, on the other hand, I think I can simply make on my table saw. In comparing the two, I found this thread where many people said they found m&t joints easier to make than half-laps. So I’m wondering, what am I missing? Do you agree, and if so, why? I’m not trying to start another thread about which is better, just which is easier for you to make? I make great tenons on the table saw without a jig and you can make a mortise with nothing more than a chisel. If you cut your mortise first, you only need to make the cut square, and you don’t need to be too fussy with the edge as it will be covered, so if you bruise it somewhat, nobody will know. From there you size your tenon to match. When laying out a mortise, I typically come in from the edge of the mating part equally, so the cheek cuts of the tenon on the table saw are all done at once. Lots of folks use other tools to speed up the mortise (router, drill, drill press) but they are not essential. Other than strength, MT joints are fantastic in that most of the working area is hidden so you have a very clean joint, especially if you make clean shoulder cuts on the tenon using a table saw. MT joints are fantastic in that most of the working area is hidden so you have a very clean joint, especially if you make clean shoulder cuts on the tenon using a table saw. ...you can also pin and/or draw pin a MT joint for added strength, and the ability to assemble large items without clamps. +1 on M/T. I’m not sure I would use half lap joints on table legs. 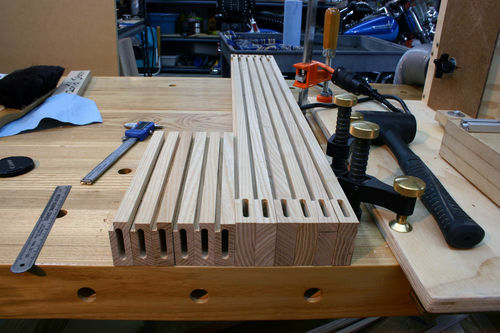 Half lap joints are easy, AND easy to strengthen. Drill and place dowels thru each joint works well. Plus, IMO they make a very attractive joint. I would probably choose a larger dowel size for table legs, matched with the selected drill bit. NOTE: If you insist on M&T joints, may I suggest using “floating tenons”, where both pieces to be joined have mortises cut into them and a piece is cut in the size of desired tenon to fit. The tenon is then glued into both adjoining pieces and clamped to dry. These are easier to fit perfectly, in that you can make them slightly loose and let the glue take up the space. 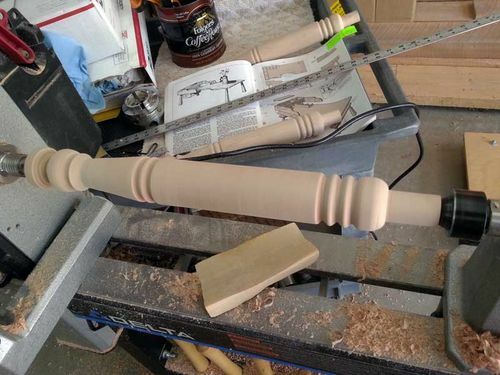 M & T joints are the bread and butter of furniture making. My recommendation is to acquire the tooling you need to make this everyday joint. The tenons are easily made on the table saw, the mortises can be made simply with a drill press and a chisel. An alternative to the the drill press is a plunge router. You don’t need large bits as 1/4” is standard mortise size for for 3/4” stock. I often make 1/4” mortises with my Bosch Colt trim router. One advantage the M & T joints have over half laps is the that the entire joint is hidden, so precision is not as critical and any errors are easily fixed. With hand tools, you don’t have to “saw and chisel to exactness”, you have to saw somewhat close and then pare down to the line. Its more about having patience and taking it slow. Unless you are on an assembly line making 250 tables or something. But if you are making a single table, take your time and enjoy the process. +1 on Mike’s suggestion to use floating tenons. Yeah, there are expensive jigs and tools for this (panto-routers and the Domino come to mind), but you can also make your own jig on the cheap. It looks like the free plans I used are now only available to subscribers at Woodcraft, but you can find these all over the place, and they can be as simple or complex as you want. If you have a decent router (I have the Bosch 1617) with plunge capability, these are pretty simple to make and use, and are now my preferable joinery method for tables. 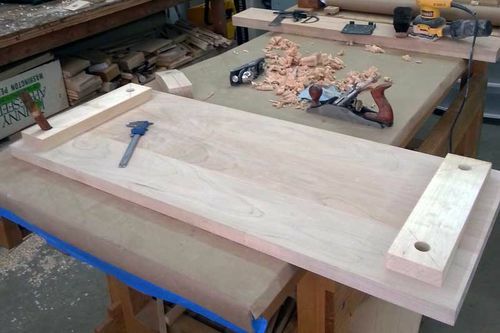 IMO – loose tenons are twice as much work since you have to make 2 mortises and then make the loose tenon to fit. There is a place for loose tenons just like there is for traditional M&T and half lap. 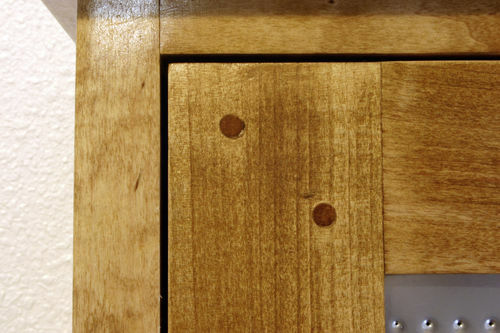 For that matter, you could dowel it, or use pocket hole joinery, just to name a few ways to go. It really comes down to your preference. I appreciate all of the feedback guys. I’m sure once I get a little practice with M&T they will quickly become a favorite. They just seem so much more complicated than half-lap. But I see what you are saying about mistakes being more costly with a half-lap. I do have a plunge router, just need the appropriate bit and some sharp chisels, which shouldn’t be too hard to acquire. By the way, love the pictures Mike! When cutting tenons on the table saw, I find it easy to sneak up on a fit when I have a mortise to test against. Don’t shoot for perfect on the first cut, and use a test piece. Once your test piece is fitting but tight you are there. Learning MT joiner is probably the best basic step you can undertake as it is the mother of all joints and will serve you well in many many applications. Strong, hidden, simple to make and easy to adjust. 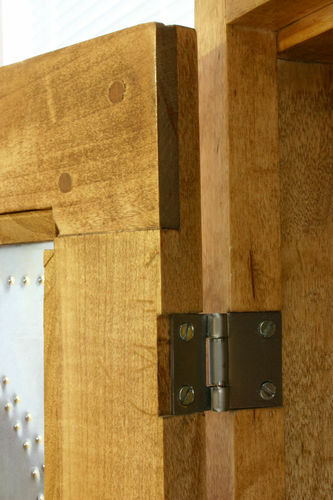 Bridle joints have twice the glue area as half lap, plus the joint looks the same front and back. That might matter for something like a door where the stiles should go fully top to bottom.